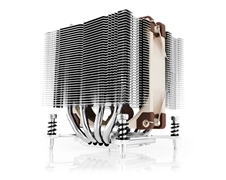 The NF-P12-1300 has been specifically developed for applications such as CPU coolers that demand superior pressure and airflow performance. 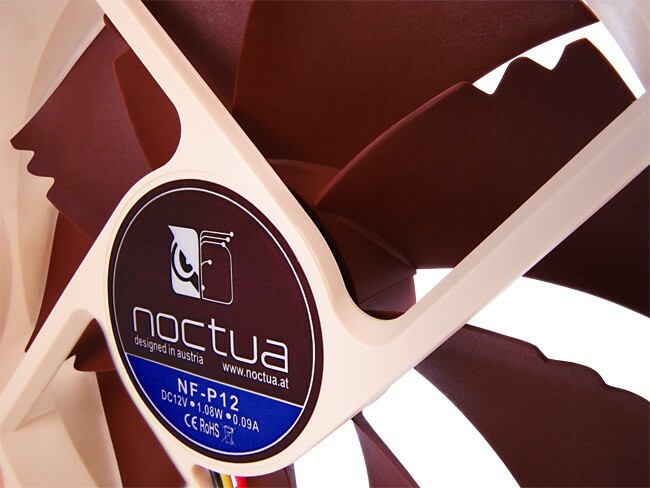 Thanks to psychoacoustic optimizations like the Vortex-Control Notches, the new SCD Drive System and Noctua's premium-grade SSO-Bearing, the NF-P12 achieves exceptional quietness and long-term stability. 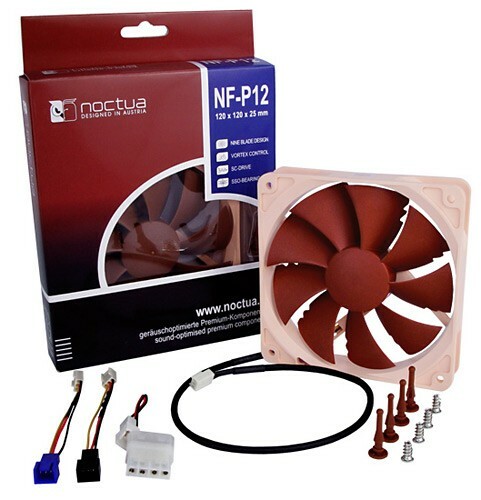 Specifically developed for high-impedance applications such as CPU coolers, water-cooling radiators or cases with tight fan grills, the NF-P12 provides superior pressure and airflow performance. Psychoacoustic optimizations like the staggered Vortex-Control Notches make the NF-P12 surprisingly quiet. The NF-P12's new drive system reduces torque variations and thereby ensures improved running smoothness. 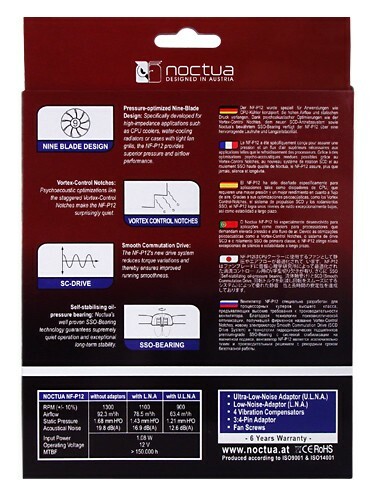 Noctua's well proven SSO-Bearing technology guarantees supremely quiet operation and exceptional long-term stability. It is blindingly obvious the amount of science and time which has been invested in the NF-P12. 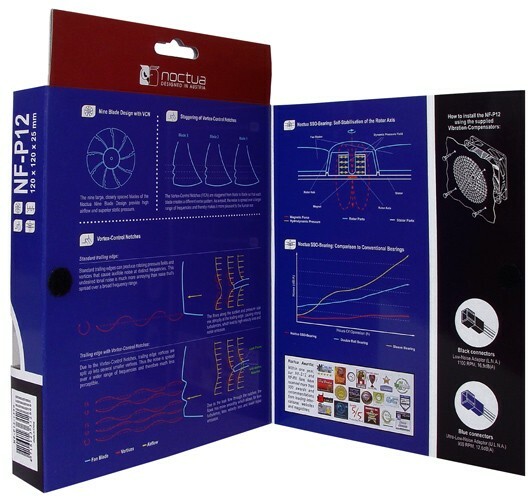 There is no doubt that it is the best 120mm fan that we have ever come across, low noise combined with decent airflow makes it a winner. 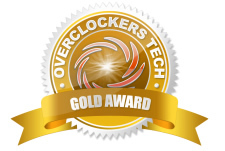 Read the full review at OverclockersTech.com. 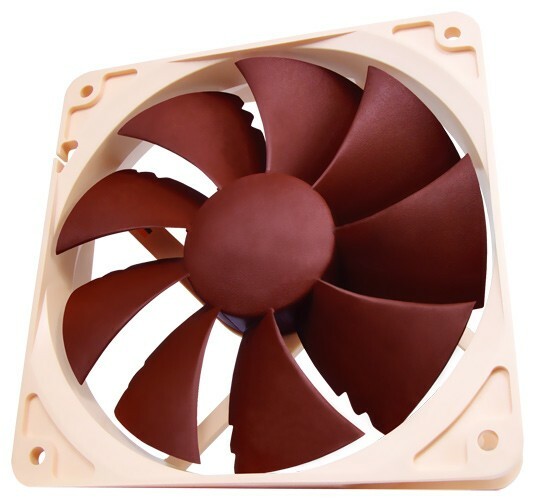 Without doubt this is where the Noctua scores heavily, being the quietest fan I've found that actually also cools. Read the full review at Clunk.org.uk. If you are a reseller or a system builder we offer special pricing on bulk orders of this product. Contact us at sales@quietpcusa.com or call Toll Free (877) 205-2020 for more information. © 2000 - 2018. Graphics and text copyright Quiet PC USA Inc. All Rights Reserved. Some parts of the web site contain images that are subject to the copyright policies of their providers.